Friday, February 21, 2013, 7:30 p.m.
Saturday, February 22, 2013, 7:30 p.m.
Sunday, February 23, 2013, 2:30 p.m.
All My Sons by Arthur Miller (Death of a Salesman, The Crucible) tells the story of two middle-class families living in the Ohio suburbs after World War II. Joe and Kate Keller are still reeling from the disappearance of their son Larry, a pilot who went MIA over the Pacific three years earlier. Meanwhile, Joe’s former business partner and next-door neighbor, Steve, is in prison after their factory was accused of selling faulty engine parts to the Army Air Force. The unfolding mysteries surrounding these two families are intertwined with the blossoming romance of their children, Chris and Ann, in a powerful, character-driven story of family, patriotism, conscience and love. 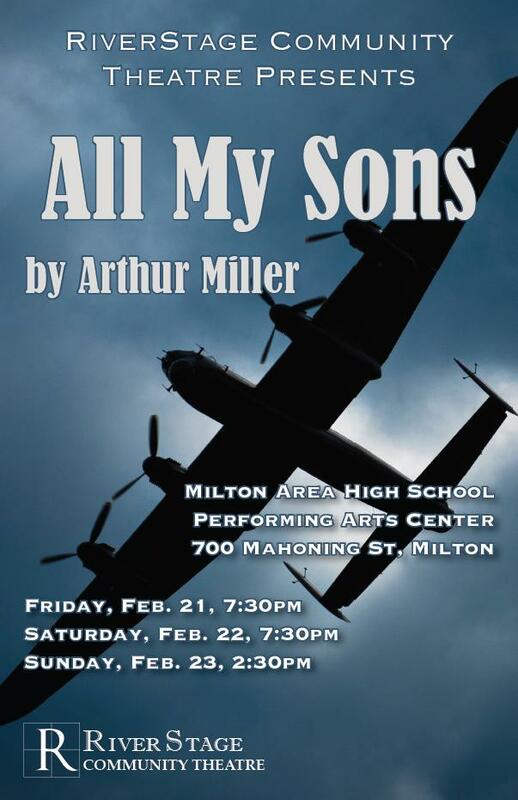 All My Sons was Arthur Miller’s first Broadway hit in 1947 and winner of the New York Drama Critics’ Circle Award for Best Play and Tony Award for Best Author. Order Your Subscription Tickets Now!